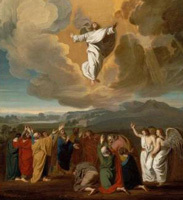 Today was the feast of the Ascension of our Blessed Lord Jesus into Heaven (yes, our diocese changed it from Thursday to Sunday). This wonderfully blessed event took place in order that our Lord might send us His most Holy Spirit to be our advocate before Him. We will celebrate Pentecost next Sunday, so this whole week is a great time to really meditate with Our Lady on the Glorious Mysteries, our need for the Holy Spirit and our hope for the coming of the Lord. Also, if you’re following, today was the third day of the Holy Spirit Novena. Come Holy Spirit, fill the hearts of the faithful and enkindle them with the fire of your Divine Love, send forth your Spirit and they shall be created and Thou shall renew the face of the earth!